With winter coming it seemed like a good idea to get the interior sleeping arrangements set up finally. Since I added drawers in the back I no longer had the flat open space to lay out in like I used to. Fixed that with a little spare wood and carpet! It lays just on top of the folded forward seats with removable legs in the center for support. Storage underneath for some gear. I split the 48x48 sheet I had laying around in half to allow for just one side or two sides to be used depending on if the wife joins. It fits perfectly on top of my drawers when not in use (or I'd just pull them out when I'm not camping with them). We are attempting a portion of the WABDR this weekend so I'll see how this goes! This past weekend my buddy and I finally decided to try out section 2 of the Washington Backcountry Discovery Route (WABDR). Saturday morning we packed up the cars and the wives joined us for what would be a great trip of exploring some of the most scenic trails east of the mountains. Weather looked clear but cold so we were in for what should be excellent views. Our trip began in Ellensburg where we took the old Durr Road out towards Umtanum ridge. Shortly after pulling off we aired down to around 20PSI which saved our rigs and backs for the next two days of rocky trails and washboard roads. We quickly gained elevation as we rose up the mountain side to our first ridge and cell tower. After a much needed stretch break around 11AM at the towers, we hopped back into the rigs and turned west, driving along the ridge. We slowly lost elevation as we bounced our way along the ridge. We could see for miles in all directions. We only passed one truck, a Hummer H3, the entire time we were on this section of the ridge which was refreshing. You certainly feel alone out there! The ridge soon turned into some pretty steep downhill into the valley floor. Most of the WABDR section hardly needs 4WD, although I'd say higher clearance is nice on some of the washouts and rutted tracks. During this section we used 4lo only a handful of times to control our speed going downhill to save our brakes. At the valley floor we drove on pavement for a 1/4 of a mile to get to the next dirt road leading south to our second ridge. Once again, we started heading up some steep hills rising a couple thousand feet and approaching the summit of Clemens Mountain and the second set of cell towers of the trip. It was around 3PM at this point, and a good time to eat a quick snack and stretch. We were now looking at a stunning view of highway 410, Rainier and the mountains beyond. Below was a plateau just above Nile, WA. This looked like a promising place to sleep for the evening. The wind chill was getting to us on the mountain so it was time to head down. The steep descent into the plateau below was stunning. If it wasn't for the fir trees, this landscape honestly seems like Serengeti (or at least as close to it as I could imagine, having not been there personally). Once down we opted to setup camp along the tree line just a few miles above highway 410. A fire was necessary as the temps began creeping down into the 30's as soon as the sun set. Dinner for the evening would be teriyaki chicken, salad and potatoes. Such a good camp meal! We chatted for a few hours sipping on Kahula and hot chocolate before finally calling it an evening. Both of our rigs were setup for sleeping inside, which worked out extremely well with the new setup I created in the Xterra. The next morning was a COLD one. Frost covered our campsite and the windows of the rigs. We slept in a little which felt great, but ultimately would set us back on completing the entire section 2 of the WABDR. Funny enough, heading down the mountain (while being a good place to camp) ultimately led us to not finding an outage to 410 on any of the trails we tried. We spent almost two hours wandering the plateau trails but found them to be either blocked in by gates or mounds of rocks and dirt. We were forced to backtrack up the mountain where we found the main trail leading down the ridge and ultimately onto 410. At this point it was too late to continue south to Packwood over Bethel Ridge. Due to our time constraint, we opted to turn north and take a few new trails back to Ellensburg. The giant loop we ended up taking took us a total of 80 miles on dirt. Not bad for a quick weekend getaway. This is quickly becoming a favorite area of mine and we would love to get back there and explore all of the offshoot trails in the area. This was posted over TNX but I'll throw it over here as well. 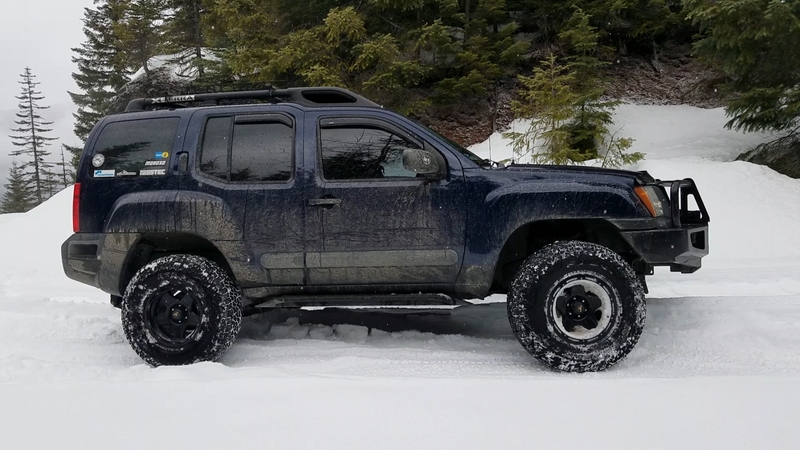 We spent the day snow wheeling up to a snowshoe trail off of Beckler Road/Highway 2 area this past weekend. What a great time! I realize now that I will be looking to invest in a better shovel (bent mine while digging out of snow) as well as a radiator skid to keep this crunchy snow from doing any damage to the radiator/oil filter. We got close, but it didn't cause any problems. I was really pleasantly surprised by the Falken Wildpeak AT3W's. I have not had a chance to get them into deep snow yet but these things just ate it up. I was at 20PSI and they did quite well. The snow quality sucked (freezing rain leaving a crusted top layer that gave way to powder underneath) so no telling how it would go if you left the wheel tracks. I also took away from this trip to that it's not recommended to snow wheel alone! We ran into a dude stuck up there overnight in his FJ with no coms. Later that day when my buddy got stuck his winch didn't work which would have really sucked if he was alone. We are loving our AT3Ws still on the JKU and my Xterra. Ate up running between spectator stages at the Sno Drift Rally a couple weeks ago. After seeing more pics of your rig I regret not doing a Titan Swap but oh well. Truck looks really good man. Thanks man! Your rig and write up on those tires are what made me decide to really give these tires another closer look. I'm glad I did! Great onroad behavior and not too loud, and offroad and in snow they are fantastic. I don't really rock crawl but I have yet to find a place where these falter. My only complaint is that they don't come in a load range C or D as the weight is up there with this tire and wheel combo. And it's never to late to Titan Swap It has been a great benefit across the board. Capability, gearing, wheel travel, larger front diff, and looks all make it worth it in my book. The downsides are the mud and dirt spray all the time, and my choice in budget front coilovers could be improved on.